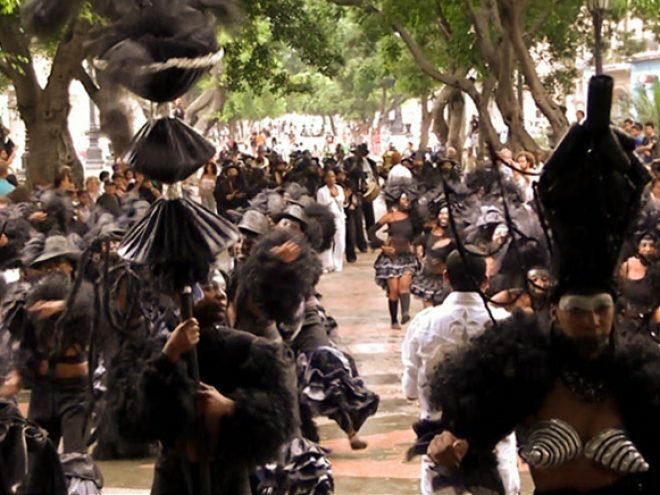 To the beat of drums and metals, and music by Yosvay Terry, Los Carpinteros’s urban intervention proposed a backwards conga, with dancers dressed in black, and music and lyrics played and sung in reverse—a true “anticonga,” although the artists’ imprint is visible in the design of the costumes and implements. Seemingly alien to the traditional poetics of the successful artists, despite its apparent strangeness, the show provides a sculptural picture, with motions that remind film images in retrospective, a comparsa that changes and rearranges, reverses the direction of the usual Cuban congas, with the purpose of making us think about the reversible—the irreversible invites us to meditate on its opposite. Contrary to the colorful comparsas, the display and the type of movement from the participants—dancers from different companies, and arts students—achieved a conceptualization of this event which gives it the necessary polysemous condition of art. Where is Los Carpinteros conga headed to? Does anyone know why they march happily into the unknown? Is the austerity of color, which denies the traditional comparsa, an allusion to a return to nothingness, which is death? Could there be a veiled reference to the concept of irreversibility so frequent in the language of politicians and the Cuban press? Dancing with a conga line going backwards reminds us of the short story by Alejo Carpentier, Journey to the Seed, or to Lezama’s exaggeration when he compared Cuba with a “conga that crosses the Urals.” However, the conga conceived by Los Carpinteros, which was documented on film by Pavel Giraud, has only produced joy, and more than searching for encrypted messages or formulating intellectual lucubrations, it prompted great fun for participants as well as onlookers, more attached to the formula proposed by the musician Arsenio Rodríguez, “Live the day for happiness,” rather than living it for philosophical or sociological ruminations. The conga is a genre of song and dance traditionally performed in the carnivals in Cuba. Its origin goes back to the festivities of the black slaves. The singular sound of a conga is achieved through different kinds of usually barrel-shaped, single-headed drums. Other unconventional instruments are also used, such as cowbells, frying pans, graters and different metal objects, including the famous corneta china, literally Chinese trumpet, which is the typical sound of the carnivals in eastern Cuba. In a conga, the musicians lead the way while the people march behind to the rhythm of the drums, sometimes in a single line or forming choreographies, as in a comparsa, dancing with sliding steps and emphasizing the strongest beat with a movement of the leg, hip or the entire body.